No matter what type of business you own, or what kind of product you’re selling, there is 100% chance that you will, in one form or another, have to interact with your customers. You want to give your customers what they need when it comes to customer service. There are a plethora of reasons to place a high value not only on customer interactions but customer feedback and needs. Because, as much as we would all like to think that in some way, our business plans and projection reports can tell us the future of where our company is headed and what the customer needs, there’s only one real way to find out that information; talking with your clients. You are providing a service to your customers based on their needs. In this ever-evolving world we live in, those needs are bound to change, ascertaining what those needs may be is a big obstacle for most companies. However, a healthy focus on communication with the customer ensures that you and your business will be in tune with the changing needs of your client base. Communication is a win for everyone – not only will you gain valuable insights into what your customer base is asking for, but you will also give your client peace of mind, and a feeling of importance. When the customer knows that your company cares about their particular needs, your potential customers will be more likely to do business with you. You want to make sure that your customers are satisfied and often more likely to return to your site in the future. There are many different ways to open up that line of communication with your customer – in-store or in person service, phone calls, surveys, and mailing lists. To keep your customers satisfied and your information up to date, live chat services on your web page is a great way to contribute to this goal in an efficient and cost-effective manner. 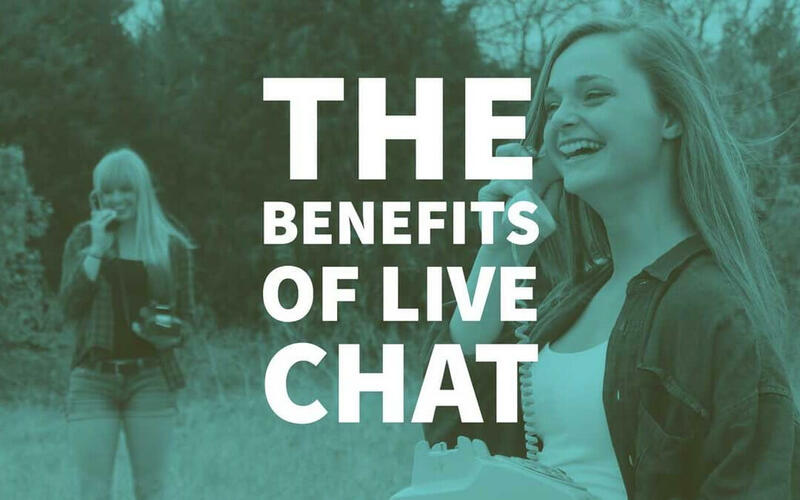 Speed, advertisement, cost, sales increase and overall customer satisfaction are a few specific benefits of live chat, which will be examined a little more closely below. It simply cannot be stressed enough that agility and speed are both outstanding qualities for any company to have in this “instant gratification” society of today. While this is true for businesses not operating primarily on the web, it is a necessity for those of us making our living in the digital world. The public today has grown accustomed to the social media speed of life – emails need to be returned within 24 hours at the latest, waiting on hold for more than 10 minutes is just unacceptable. Having a Live Chat option enables the customer to access a specialist at your company, instantly. Instant is always the goal, not only for the customer but your company. While this instant gratification, no wait time, interaction is appealing to the customer in regards to convenience, it’s also an opportunity for you and your company to give your web page a face and personality, which cannot always be communicated so quickly with a simple web page or an introductory video. When you have potential customers looking at your products or services, you want to be able to help them as quickly as possible and be there to help if they have any questions. Instead, of customers having to call you or send an email and wait for a reply, which is viewed as a big hassle these days, you can offer your clients instant help through a live chat service. The faster your help your customers, the more confidence they will feel in trusting you with their time and money. When someone uses a professional live chat service, they can get answers that they need to complete their order, this is the immediate goal, and if nothing else is accomplished – well, it would be tough to consider that a failure, however, this is not usually the case. The professional live chat service specialists who are answering questions will also be trained in upselling and cross-sell techniques. These methods give specialists the ability to gain insights into the customer’s potential needs and offer additional or ancillary products that will satisfy those needs. It will be the goal of these specialists to get your customers to buy more of your products and to make sure that they are happy and completely satisfied with the customer service offered. Without a service like Live Chat, this additional advertisement and opportunity for sales would not be possible. People do not want to hear about any special offers after they’ve been on hold for 20 minutes, and additional sales do not come through as strongly through an email as they might come from a trained specialist’s voice. Utilising the speed of live chat and the advanced capability and charm of a live chat specialist can increase opportunity for sales and serve as advertising for many products related to those commonly listed on an FAQ. When you switch from phone chat to live chat, you are not only going to be utilising a service that will benefit your company’s intelligence and your customers’ satisfaction, you also stand the chance to save money on each interaction. By reducing your overhead, you will end up making more profits, which is always a good idea. If you want in-person interactions, you must have office space that is costly and inefficient, as you will only be using this space, more than likely, for answering FAQs and providing supplemental customer service. As far as phone service goes, while you still get the opportunity to showcase a specialist, this process is much slower, and if you are a business wanting to operate internationally, phone costs could get very high very quickly. Choosing to add a live chat option to your website can be a cost effective way to upgrade your site. It is a smart investment that will pay off each time that someone uses your service. Even if a customer uses the live chat service and doesn’t decide to buy anything right away, they will have hopefully walked away with a better understanding of the services you offer. The client is going to be more likely to return to your site for future needs or refer a friend if they have had a positive, informative, satisfying experience with one of your live chat specialists. Additionally, existing clients who use the service will receive a sense of importance from your company and feel gratified in believing that their opinion matters to you and your company. The live chat option gives the customer the opportunity to form immediately an opinion about the product and the site while no product is universal, quality customer service is. If you can provide rapid, informative, and courteous customer service to your clients and potential clients, you will gain one of the most powerful, if not the most powerful, marketing tool out there; word of mouth. There is no commercial, flyer, or email that will encourage you to try a product more than a friend’s recommendation. If the customer inquiring about your products does not wish to buy a product but leaves with a full understanding of your products, services, and a positive first experience with your company, they will be very likely to return to your site or refer your services to a friend. If you want to better your chances of selling your products or services, offer premium features that will make your business more appealing. With the internet as powerful and available as it is, in our new society of instant gratification and seemingly endless options it is tough for a company to stand out. Even with fantastic products and services, it is extremely easy for a simple, well-running business to be overlooked again and again. Do everything you can to show your potential client base that you are committed to their needs, you want them to be heard, and you are making the service as agile and optimal as possible. It is in the best interest of your company and the customer to create a system of customer service that is rapid, cost-effective, and informative. Your customers should be able to get the help they need right away, and you will benefit from offering them reliable services. Your customers want to feel like their opinion is important, and their concerns are heard, and you will benefit from learning more about your clients’ ever-evolving needs. When you offer excellent customer services, your customers will want to continue doing business with you for a long time to come. Choose to have a live chat service on your website and enjoy knowing that your customers will be taken care of around the clock. Keep Going , i learned a lot form these articles. Around 31% site offer proactive chat options and are ready to help customers in anyways. It means integrating live chat is mandatory not an option. Here stuart had covered some great benefits of having live chat. This is a very well thought out article. You are right on the money. Communication is essential and the quicker you can communicate with your customers, the better. Nicely thought out. Good read, good points made also. Weel thought out, informative and useful information. Thank you for sharing this article.